We have a number of gorgeous faux furs this season, just right for trimming a wool coat or making a whole garment! This bronze faux fur has a slightly metallic effect and a black underlayer that creates great texture. This red fur has a stunning deep hue and is as soft as baby bunnies! We have Persian Lamb in both black and grey. It's not really made from lambs! The cropped, curly texture is reminiscent of a lamb's wooly coat. This deep-pile jet-black fur is classic and has a great shine. Love florals? These small-scale Dutch-style chintz prints are a fabulous mix of historic and modern style. Small florals are easy to wear or blend fabulously in quilts. And with all the lovely colors in each print, more is really more! You still have time to pick up a few last-minute gifts! 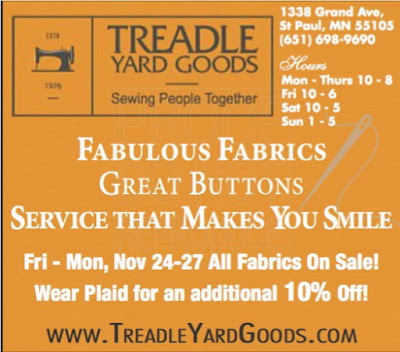 Take a look at some of these great grab-and-go gifts and stocking stuffers at Treadle! Handy sewing kits in gorgeous vintage-print tins! Handloomed cotton or silk scarves from India! Adorable, artsy ornaments made by our own Treadlette Nina! Sweet cloth bags of Vintage Textile Soak, just right for washing an antique quilt! Zirkel: absolutely the best, most powerful magnetic pincushion available! The Yo-Yo Magnifier: a super handy, collapsible magnifier with task light. Perfect for ripping out stitches or doing fine hand work! Scissor Tethers: never lose your scissor again! Or, if you just don't know what to choose, there are always Gift Certificates! Available in ANY amount! Stop in and find the perfect last-minute gift at Treadle! 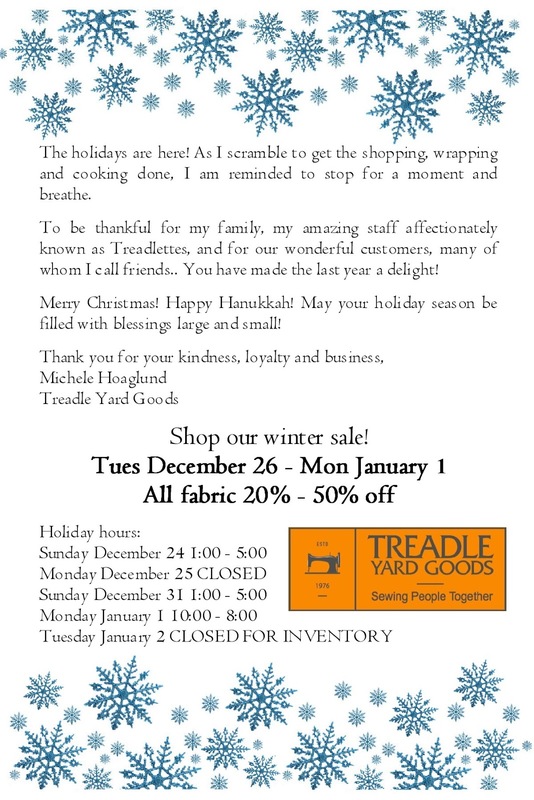 We are open 10-5 Saturday and 1-5 Sunday (Christmas Eve). Wrap yourself up in a cozy sweater knit! Make it your way: cardigan, pullover, drapey, fitted, whatever you like! Check out these two new cotton prints by Connie Haig for Free Spirit fabrics. The thistle flowers have a lush, painterly appearance, while the pomegranates are bursting with juicy color! It's the season for dressing up! With one of these fabulous printed silks, you can make something pretty for layering or perfect for your next social event. Try a simple shell or slip dress - you can whip one up in no time! Take a look at our new Cascade Fleece. It looks like wool, but is 100% polyester and machine washable.We have five wonderful colors: garnet, coal, charcoal houndstooth, oatmeal, and bayberry. The texture is wooly enough to look like the real thing! Perfect for coats and jackets for everyone! Have you heard? Our Winter & Spring 2018 class schedule is now available! We have loads of recurring favorites, such as Continuing On, Basic Sergery, and Copy Ready-To-Wear. There are lots of exciting NEW classes too! 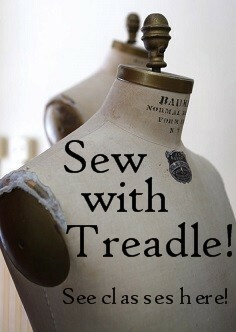 Make great dresses in Dress Your Best, or sew for the kids in your life with Sewing Kids Clothes. Plus our Weekend Sewing Marathon is back for another round! And SO much more! Visit www.treadleyardgoods.com/classes for the full schedule! To register for classes, call us at 651.698.9690 or simply stop by the store. We have some gorgeous new Malden Mills Polartec 200 fleece. This double-sided fleece is the good stuff: perfect for jackets and vests to keep you warm and cozy! Available in 4 rich colors: kiwi, brown, spruce and poppy. They are 60" wide and made of 100% easy-care polyester. It's the time of year to make a new wool coat. With these classic plaids and stripes, you'll be warm and stylish, too! We all know wool males great coats, but lighter-weight wools are ideal for dresses, vests, trousers, and skirts. These light to medium weight wools will make wonderful, warm wardrobe additions!